One bedroom apartment with comfortable double bed, a closet, simple decor and fitted carpet. Bathroom is fitted with shower and have neutral tiles to walls and floor. Not to mention, a balcony where you can relax during the night or day. Property also benefits of fully equipped kitchen with all the appliances including microwave, toaster, kettle and kitchen ware. Living room is equipped with TV. Our Sheffield Modern Apartments are two properties where you can choose from upon booking. These apartments are both great selections because of its modernised design and style where steel and white paints blend and complement, greatly matches Sheffield’s other famous name as the “Steel City”. 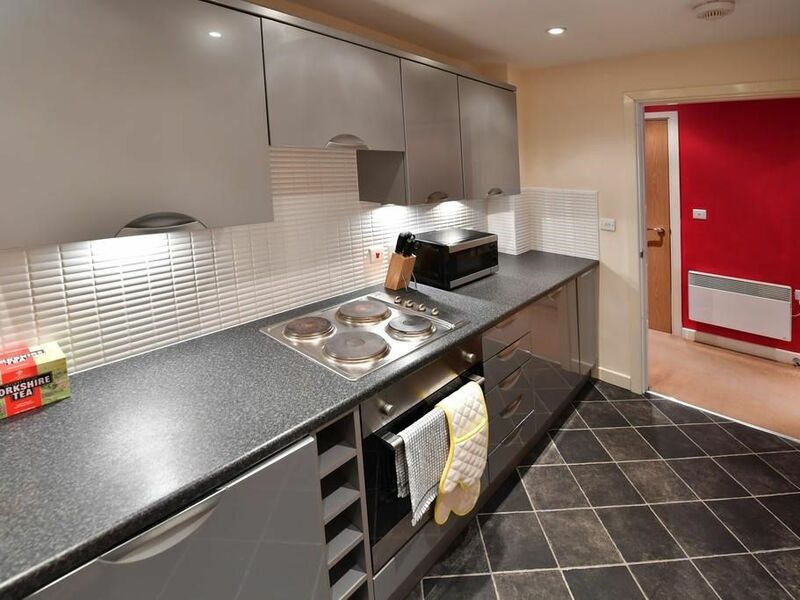 Our apartments are truly remarkable and your best choice for accommodation here in Sheffield. Both of our apartments are with a balcony where you can see the beautiful city views while enjoying a cup of coffee. You can also relax in our living rooms equipped with flat screen televisions and comfortable sofas. The natural lighting that comes from the outside world brightens up the mood of the apartment and matches the dark yet lively color combination in the property. You can even enjoy Free WiFi at the apartment to get connected with families and friends while on business trip or vacation. Our apartments have modern kitchens that come with microwave, oven, kettle, and washing machine that are necessary for your trips. We also have a dining area for each property where you can sit and think on what will be your next activity during your stay in Sheffield. But if you want to experience Sheffield’s most amazing food finds, you can definitely go and dine with restaurants such as 18Fifty5 Restaurant, Jump n Jive Café, Harwood Street Café, Persian QashQai, Rossi’s, Wareesha Spice Restaurant and Bar, As Thyme Goes By and many more. Almost every great find is accessible from our apartments! So, if you are traveling for Sheffield, we recommend you to try our Sheffield Modern Apartments to easily access all of these! Remember as well that the Doncaster Sheffield Airport is also 43 km from the property so you can definitely get a dose of Sheffield’s scenery while you’re on your way to us and vice versa. Sheffield Modern Apartment Travelling to beautiful places has been my go-to in life. As your Host, you probably won't meet me personally however, we made sure that you will be comfortable and satisfied during your stay with us. Feel free to reach my through email or text with information and tips on unusual stuff to do and see when you visit. Sheffield Modern Apartments is a modern, well-presented one bedroom apartment with a balcony situated in a popular development, conveniently positioned for access to the city centre, train station and university.